“Alchemists have often been considered eccentric. They appear to labour on tasks the mainstream either don’t comprehend, or consider impossible. Yet the alchemists of old and the modern-day spiritual alchemists are the ones who see reality most clearly and understand divine power most accurately. They know the healing transformational power of divine energy is beyond any limitation the mind can conceive. This is why they never assume that something is impossible; they are open to the workings of divine will and how healing can best happen (which is not always in the ways one might expect). They do not see reality as ‘fixed’ and the material world as a solid impenetrable unchanging form. They know that all creation is energy, and energy can change form. When higher consciousness is applied to the energy, the form which evolves is one of shining divine beauty. The soul task of divine alchemists (whether they think of themselves in those terms or not) is to repair the damage that fear-based consciousness has generated in the world. A divine alchemist may do this with a focus on environmental or socio-economic issues; or through the arts, creative expression, healing work with the body, mind and soul; or through cooking and educating others about nourishment. Alchemists may do their work on the greater human collective powerfully but behind the scenes. They may do this by bringing higher consciousness into their own being and then allowing that to permeate their worked in the corporate, financial, legal or political sectors, or in the worlds of marketing nad media, where their elevated spiritual frequency is so very needed at this time. No matter what realm you enter, your soul has the ability to trigger alchemical change. Whether you are always conscious of it or not, your presence is helping to repair bodies, minds, hearts and souls from the terror that has been conditioned into them over lifetimes. You are helping to heal the doubt, fear-based habits and self-destructive behavioural patterns that plague the human collective psyche. You are here to apply love, higher understanding and wisdom to the world. In the application of that higher consciousness, alchemy begins; and in time, genuine divine beauty rises up out of the sacred fires of transformation. The ugly duckling realizes it is a swan. When the Oracle of Divine Alchemy comes to you, you are being advised that something in your world, perhaps even in your body, is going to be blessed with healing transformation so profound it can never be undone. This spiritual repair is not simply a patch-up job, but a profound reconstruction that will change the substance, quality and consciousness of that physical world reality. There will be a purging and a reconstruction. 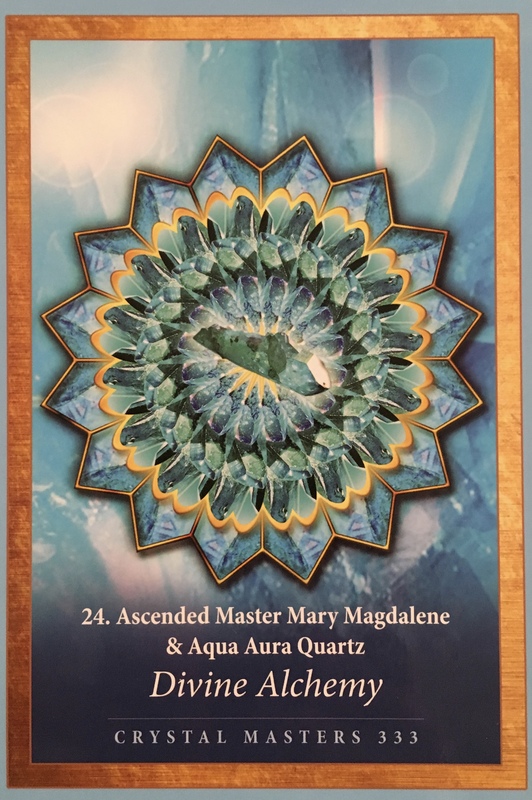 ‘I call upon the Crystal Angel of Aqua Aura Quartz and Ascended Master Mary Magdalene who love me unconditionally. Thank you for the healing blessing of divine alchemy. May I be gifted with unassailable faith in the complete healing transformation possible with higher consciousness. May that which has become damaged, be repaired. May the consciousness that has become diminished be revived into unconditional love. May all divine alchemists that serve unconditional love be empowered, supported, sustained, inspired and motivated in their work until they manifest the divine potential seeking to be liberated through their service. Through divine will and my own free will, so be it. You have done so much amazing work in the last few days. How do you feel? What is happening around you? How is your reality shaping up? This is a message of great blessings in the form of healing and expansion. A true gift from the Universe facilitated by Mary Magdalene and Aqua Aura Quartz. Aqua Aura Quartz amplifies our connection to the spiritual reams and higher dimensions of consciousness. Key Words: Calming and relaxing, connection with spiritual realms, enhanced communication, psychic protection. Aqua Aura Quartz is highly stimulating to the throat chakra, enhancing one’s ability to communicate inner truth. It also has a calming effect on the emotional body. can be used to soothe anger, cool feverishness and release stress. It is a stone for enhancing one’s access to the truth of the emotions and the inner portals of Spirit. It can be an aid in becoming a conscious channel for spiritual wisdom. So as you can see, this is an important stone for us to work with at this time. But do not worry if you do not physically have the stone, as the mandala in the image above is extremely powerful and can be used to connect directly to the healing properties of the Aqua Aura Quartz deva. Simply take a few minutes to gaze at the image with the intention of receiving a personal message or healing blessing. Close your eyes and breathe in the high vibrational energies of the mandala. Visualize your gift of healing alchemy bestowed upon you. Know that this is a gift of deep and profound transformation.